Once upon a time, there was a lovely little Irish discussion and translation forum on the internet. The members of the forum were good friends and, when they weren’t busy doing tattoo translations, discussing the tuiseal ginideach and the modh coinníolach, or dissing the Caighdeán Oifigiúil, they enjoyed playing word games. Favorite games included Fiche Ceist (“Twenty Questions”) and Raight Inglís Iúsuinn Aighrís Fáinics (“Write English Using Irish Phonics”). These games were educational as well as a lot of fun. Fiche Ceist, for example, was a great way to sort out the difference between Tá and Is, and Raight Inglís Iúsuinn Aighrís Fáinics really helped new learners get a handle on the Irish spelling system (which is a lot easier than you might think). One day a member of the forum, having just had an amusing (if a little embarrassing) experience at a Mexican restaurant, invented a new game: “You Know You’ve Been Studying Irish Too Long When…”. The goal, of course, was to finish the above sentence. The game was an immediate hit, and the responses ranged from the rueful to the hilarious. Unlike the other games, it wasn’t particular educational, but it was definitely a bonding experience for people learning a minority language. …You find you have an incredible urge to lenite words following “the,” “my,” and “your,”regardless of what language they’re in. …You run across an English word starting with “ch,” “th” etc., and you find yourself automatically converting it to “root” form. …You realize that “ng” seems like a perfectly logical and normal way to start a word. …English words start to look wrong if they don’t follow the “caol le caol” rule. …You want to look up “lenition” in an English dictionary, and realize after about 10 minutes that the reason you can’t find it is because “lenition” doesn’t begin with an “s” in English. …After spending time looking at a site with songs in Welsh, Manx, Scottish Gaelic or Cornish, you find it a relief to run across a song with “normal looking” (i.e., Irish) words. …You find yourself swearing at other drivers on the freeway and realize the reason they’re giving you baffled looks is they have no idea what you’re saying. …You say “hello” to your neighbor and she gives you a funny look because, in her world, “hello” starts with an “h”…and just who are you calling a “witch,” anyway??? …Your idea of a dream vacation changes from a week at Club Med to a week at Oideas Gael. …You see ‘teach more’ and you think it should be ‘teach mór‘ and then you realize it’s an article on education! 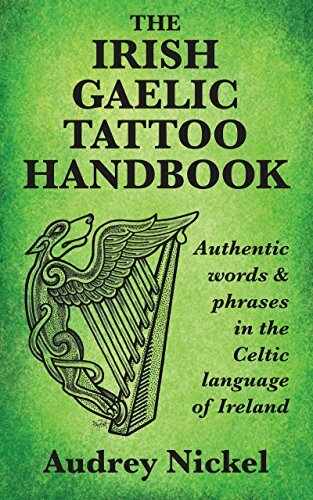 …You’re thinking in Irish, writing in English, and inadvertently post on Facebook in some hybrid form (must be where Hiberno-English came from!). …You find yourself thinking “‘Wanker?’ I thought it was just the vocative of “‘banker'”. …You mix up languages mid-word! I showed up a bit early for a sean-nós lesson the other day, and the teacher asked me if I’d like a cup of tea. I started to say “No thanks…I’ve got water.” But just as I started to say “water,” my eye fell on my water bottle, and my brain helpfully supplied “uisce.” As my poor brain teetered helplessly between languages, what actually came out of my mouth was “no thanks…I’ve got whiskey!” (I knew I wanted an English word, but grabbed the wrong one out of the air!) I’m sure my poor teacher wondered what I was doing drinking whiskey at 11 a.m.! …You hear someone say, ‘Feck him, hey?’ and wonder what they are looking at. … Dhiú raoid d’fhios ait nórmal spaoi d’ain d’iondair stain duit. …The people around you, who have never studied the language, know what you’re saying! I was at choir rehearsal the other day and the director said “get out the Batten” (as in “O sing joyfully,” by Adrian Batten). I was having trouble finding it in my folder, and muttered “Ca bhfuil sé…sin í an cheist!” and the person next to me helpfully answered “Orange book, page 70.” (She was texting at the time, so it wasn’t like she was watching me paw through my folder or anything like that). …You realize you have absently labeled the chainsaw files “beag” and “mór” and your son can’t figure out which is which. …You look up “rithim” in your Irish dictionary because you never can remember how to spell “rhythm” in English. …You try to recall the Our Father or Hail Mary in Latin or French (both of which you’ve studied), but it somehow turns into Irish by the second or third line. …You find yourself taking a close look at people’s tattoos in the hopes of finding one of your translations. All of the above (and many more) were supplied by various members of The Irish Language Forum and by erstwhile members of the now-defunct Irish Gaelic Translation Forum (many of whom are one and the same). Maybe you can think of more! Let me know your thoughts in the comments below!